The guys from Victory and Associates sent their latest heavyweight gold single on Seismic Wave Entertainment. I love these heavy, thick singles and thick cardstock sleeves. It's actually printed with a gold ink, not the orangey yellow pictured above, something about this gold and red looks like some kind of ska sleeve or '50s smooth jazz...it looks like a casino. Maybe it's just me. What's actually going on is crystal clear power pop punk. Catchy power chords and yelling choruses, about...what else? The party. Rocking out, throwing themselves into the riffs and harmonies, everyone's doing their part. Part Les Savy Fav and part Hot Snakes, it's scientifically proven punk rhythm and power chords, all at out of control speed. 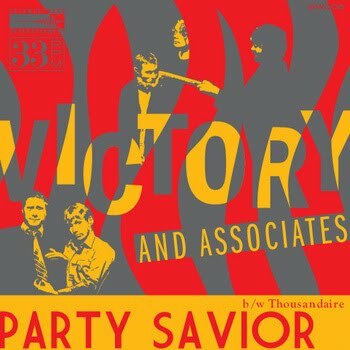 The A-Side,"Party Savior". If there was any question in what direction they're taking, then this is their answer. There's a mythical character called the party savior who is going to turn this whole thing around, be prepared. It might just be Victory and Associates. It might be you...after hearing them. It all comes down to Conan's vocals, it almost seems like he hardly needs instrumentation. In those moments where they break that frantic melody to keep the track shooting forward with just their harmonized voices and a kick drum, for that fake break, for a chance to kick it all off again. Did you forget how loud it is? They aren't letting you off that easy. Their going to keep rocking you. In "Thousandaire", Conan sets the tone again just vocally, kicking the track off to great back and forth separated guitar riffs that explode together bringing, once again, their massive sound. There's hardly a moment they pause vocally, if there aren't multiple harmonies at any given time then someone is calling back in between Conan's verse. It feels like they literally throw everything they can at the track, there's no room for a guitar solo. You want to like a band that's actually inviting you in to go along for the ride as opposed to being left out, fighting to understand what's going on. I can't help but picture this live and an audience being on board immediately. Prepare to win. Get this one from Seismic Wave Entertainment.